We all know that Selenium is probably the most used tool for end-to-end (e2e) testing. If you have written e2e tests recently you have probably used Selenium or Protractor (if you were using Angular/JS). If that's the case and you have had to fight against the async hell, you will understand why the need of a new framework that improves that for us (among other stuff). And that is Cypress. Cypress is not just an e2e tool but a frontend testing tool, as it allows us to write e2e, integration and even unit tests! Boom! As they say, you can test whatever runs in a browser. It is not based on Selenium, so that is why it is quite different than other existing tools. One current downside of Cypress is that it only runs in Chrome browsers but supporting other browsers as Firefox, Safari and IE is on their roadmap. This is key to decide whether to use Cypress for your project or not, at this moment. Let's give an introduction of what Cypress can do for us with an example. We are testing an existing application that can be found in this Github repository. In this article we will focus on e2e tests but, as said before, it can be used to test anything that runs in a browser. You can also install it with npm or as a standalone program. 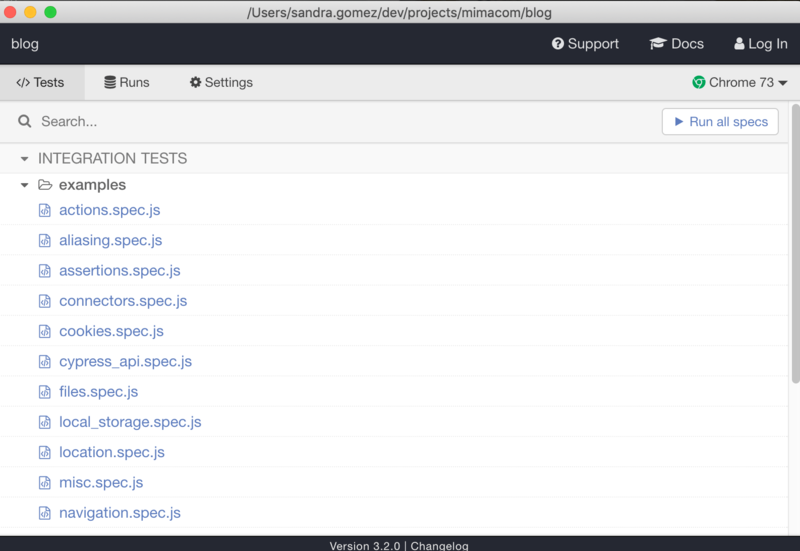 You can run a test by clicking on it or run all the tests by clicking on Run all specs. fixtures: data files to be loaded in the tests (json, images, etc) to mock data. plugins: extensions of the behavior of Cypress via plugins. support: utilities to improve the tests, you can add custom commands, customize existing commands or add any other logic that must load before your tests. In this post we will focus on writing a test and interacting with the tool, in a next post we will cover what are the other folders used to. When the user types the name of a song in the search bar and then clicks the search button, a list of songs should be listed. Then, let's create a new file in the integration directory called search.spec.js. Cypress uses a set of libraries to easily write the tests. If we run this spec a new browser window will open, the address indicated in the cy.visit() command will be typed and we will see the homepage of the application. This application relies on the Spotify API to work, so if we do not have a valid OAuth2 token, searches cannot be done. When a valid OAuth2 token is not found, the application requires the user to click on the Get a new token link and is redirected to the Spotify OAuth2 login to authorize the application to use his/her data. Cypress does not allow to click links leading to external websites as you should not test a third party application. Instead, you should just test your <a> has the proper href value. In this case, we will use the Client Credentials OAuth2 flow so the OAuth2 token can be obtained avoiding any user interaction. The application just needs a token stored in the localStorage. To get a token we need to use the command cy.request(), which facilitates the submission of forms via http and takes care of waiting until everything is ready to continue with the test. When the test runs again, the search bar and button will be displayed, as Cypress has dealt asynchronously with getting the token behind the scenes. HTML elements can be accessed using two commands cy.contains(), which searches elements with a given text and cy.get(), which searches elements based on common jQuery selectors (i.e. : ids, class names, etc). Generally speaking, it is better to use get as you can select elements more specifically. Although, the recommendation from Cypress is, if possible, to create a dedicated attribute data-cy. This way, this is used as a dedicate Cypress selector for the elements in the page, to avoid causing a failure just because the label of a button changes (assuming this should not make the test fail). For instance, the selector for the search button would be better addressed with [data-cy=search-btn] than with button[type=submit]. Both get and contains are commands that can be chained with other commands to allow interaction with the elements such as type(), focus(), click(), blur(), etc. Furthermore, you can chain the command should() to use Chai assertions on a given element which, in the end, make the tests very readable. All Cypress commands run asyncrhonously so you can chain them as needed letting the framework making sure the elements are loaded before using them. When Cypress runs the test, each of the defined steps are displayed on the left side bar allowing the user to see the state of the application at any point of the test. Navigation between the steps is possible by just clicking on each step. For instance, if you click on step 5 - TYPE, you can see a snapshot of what the DOM looked like before and after running that concrete step by clicking on the before, after buttons displayed at the bottom. Before typing the name of the song, the search button was disabled, but right after the search bar contains text, it becomes enabled. You can also interact with the application using the Chrome developer tools at any point of the test so you can easily debug every action carried out by the test. In the example above, the most accurate selector for the label No tracks found. is its class name .no-tracks. Cypress is a promising tool for writing e2e tests as it has many advantages such as debugging, async management, readability... and many more that we could not have shown in a single blog post. This was just an initial overview of how to write a test with Cypress and how to interact with the tool. In a soon to be published blog post we will talk about more complex use cases involving the use of commands and plugins, to deal with situations closer to the real world. Pay attention! It is coming soon! Full-stack engineer at mimacom, although recently has a tight relationship with microservices... Now searching for a spot within the hipster frontend technologies.